Arizona has so many weapons that it was quite clear Michigan was going to win as a team or lose as a team. There was no way, especially on the defensive end, that Michigan would have a stopper like Caris LeVert or Glenn Robinson III take over the game and will the Wolverines to victory. 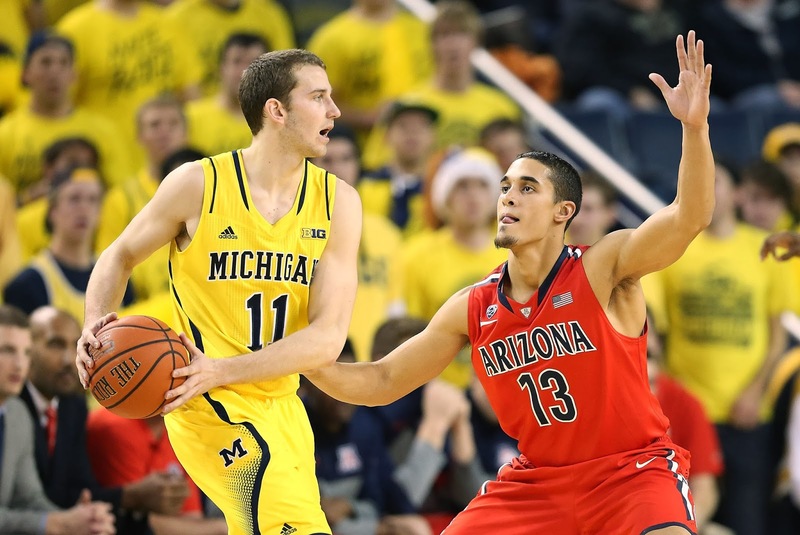 Unfortunately for Michigan it was a poor showing from just about everyone sans Jon Horford. Jon Horford got very extended minutes do to an ailing Jordan Morgan and his defense in the post was outstanding; 9.5 forced misses in just 17 minutes is incredible. What Horford did was force the Wildcats to start (and end) their comeback charge from outside the paint. That's where guys like Zak Irvin, Derrick Walton Jr., and LeVert failed miserably. 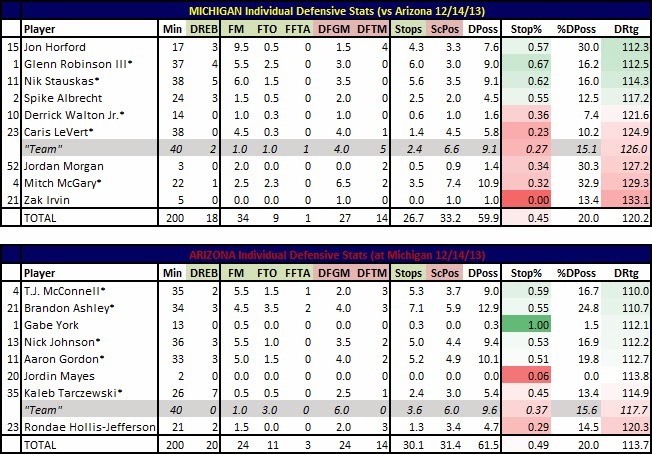 Surprisingly, this was one of Nik Stauskas' best defensive games that I've charted. He's normally in the "red" in terms of comparing his DRtg to the team's overall DRtg. He proved to be a semi-bright spot in the loss showing what he's capable of (six forced misses1.5 forced turnovers). What will take Arizona to the Final Four and beyond is the team's defense. Michigan is always one of the most efficient teams in the country offensively so the 113.7 team DRtg isn't actually as bad as it looks. 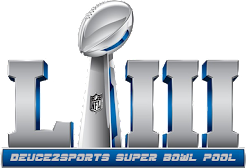 What's impressive is how it was a complete team effort in terms of how the Wildcats won with defense. T.J. McConnell and Brandon Ashley were great at forcing turnovers but also forced 10 combined misses while Nick Johnson and Aaron Gordon weren't as stealthy in terms of taking the ball but combined for 10.5 forced misses. Everyone for the Wildcats was a menace on defense. Kaleb Tarczewski could be called the "weak link" but what he lacks in defensive havoc he makes up by grabbing missed shots (7 against Michigan). It will be interesting to see how Michigan responds from here on out. The loss dropped the Wolverines to 6-4 and, despite three of those four losses coming to top teams (Arizona, Duke, Iowa State), a brutal Big Ten schedule looms. There isn't much doubt, however, that Michigan is the best four-loss team in the country.